Yes, that’s right! The car is in the garage and it’s hunting for blood! The Car is a pretty stupid movie that doesn’t really work but at least it’s enjoyably stupid. 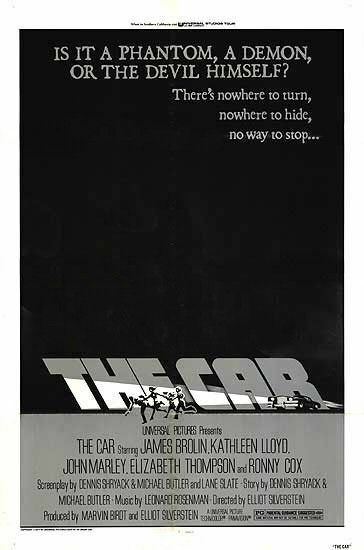 From the minute I started watching this movie, I knew that the only way I could recommend it would be if James Brolin shouted, “The car is in the garage!” at some point. When he did, I had to cheer a little. I love being able to recommend a movie. The Car takes place in the small desert town of Santa Ynez. Nothing much ever seems to happen in Santa Ynez, which perhaps explains why the police force is so large. (Why wouldn’t you want to be a police officer in a town with no crime? It wouldn’t be a very demanding job.) Sheriff Everett Peck (John Marley) keeps the peace and sends his time talking about how much he hates bullies. Wade Parent (James Brolin) is his second-in-command and has a 70s pornstache. Wade’s best friend is Deputy Luke Johnson (Ronny Cox), a recovering alcoholic with impressive sideburns. And then there’s a few dozen other cops. Seriously, this tiny town has a HUGE police force. One day, however, the police finally get something to do. A black Lincoln Continental has suddenly appeared, stalking the roads around the town. It doesn’t have a licence plate and the windows are tinted a dark red so it’s impossible to see who — if anyone — is driving. Stranger still, the car’s doors have no handles. When the car does show up, it seems to appear out of nowhere and once it’s run someone over, it seems to vanish just as quickly. When the car first appears, it runs down two cyclists. A few hours later, it kills an obnoxious hippie hitchhiker (John Rubinstein). The only witness was alcoholic wife beater Amos Clements (R.G. Armstrong). When Amos goes to the police, the car tries to run him over as well but instead, it ends up killing Sheriff Peck. Now, Wade is in charge and he has to do something about the car. Unfortunately, Wade’s girlfriend, Lauren (Kathleen Lloyd), made the mistake of screaming insults at the car when the car attempted to run down the school marching band. Now, the car is stalking her. Meanwhile, Luke is convinced that the car is being driven by none other than devil. Wade says that’s impossible. Luke points out that the car refuses to drive through consecrated ground.